California autumn, in the Temecula Valley. This piece is available, beautifully framed, through Randy Higbee Gallery. 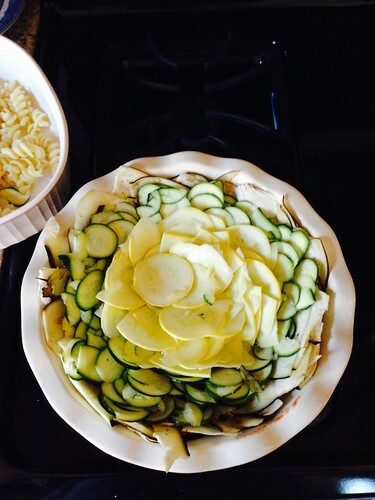 And now to put the finishing touches on dinner and enjoy Thanksgiving with friends. 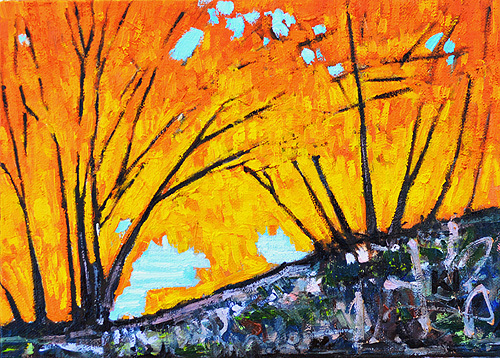 This entry was posted in Landscape Paintings, San Diego Paintings and tagged 6 x 6 inches, autumn, landscape, leaves, oil on panel, southern california, temecula, trees, yellow on November 27, 2014 by Kevin. 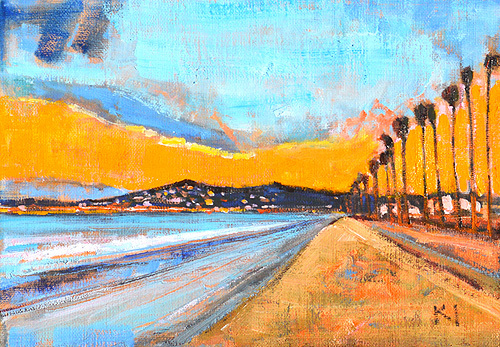 This entry was posted in Landscape Paintings, Seascape Paintings and tagged 4 x 6 inches, east beach, landscape painting, oil on linen on panel, santa barbara, sunset, yellow on August 21, 2014 by Kevin. 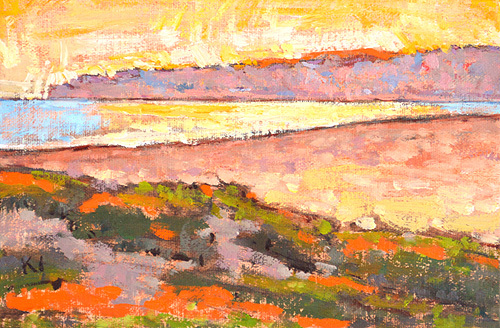 This entry was posted in Landscape Paintings, Seascape Paintings and tagged 5 x 7 inches, east beach, gold, oil on linen on panel, santa barbara, sunrise, sunset, yellow on July 8, 2014 by Kevin. 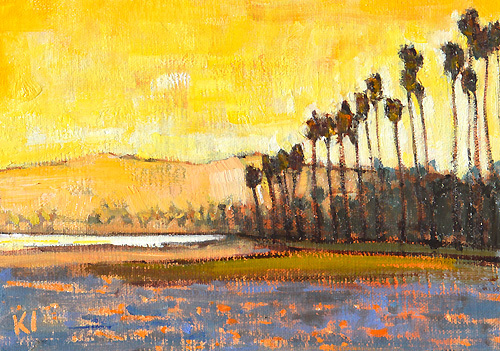 This entry was posted in Daily, Landscape Paintings, Seascape Paintings and tagged 5 x 7 inches, beach, east beach, oil on linen on panel, palm trees, santa barbara, sunset, yellow on June 18, 2014 by Kevin. Off to the gallery in Santa Barbara first thing Saturday AM. 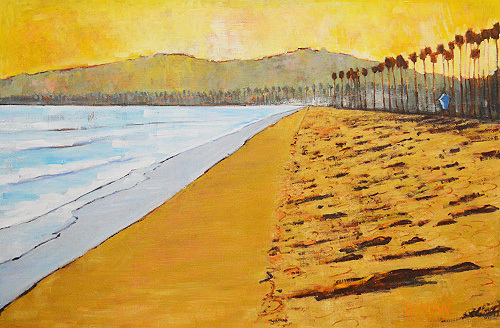 This entry was posted in Landscape Paintings, Seascape Paintings and tagged 20 x 30, beach, oil on panel, santa barbara, sunset, yellow on May 22, 2014 by Kevin. 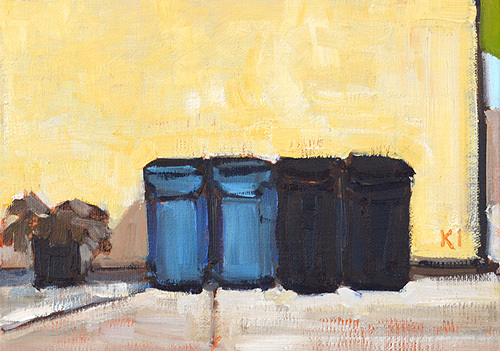 This entry was posted in Landscape Paintings, San Diego Paintings, Urban Landscapes and tagged 5 x 7 inches, alley, california, mission hills, oil on linen on panel, recycling bin, san diego, trash can, urban, yellow on April 19, 2014 by Kevin. 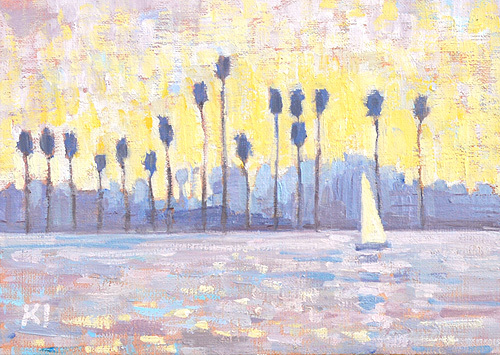 This entry was posted in Landscape Paintings, San Diego Paintings, Seascape Paintings, Urban Landscapes and tagged 5 x 7 inches, mission bay, oil on linen on panel, palm tree, sailboat, san diego, yellow on March 17, 2014 by Kevin. 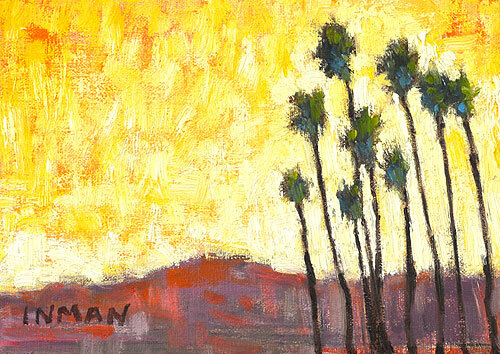 This entry was posted in Landscape Paintings and tagged 5 x 7 inches, california, east beach, oil on linen on panel, painting, palm tree, santa barbara, sunset, yellow on January 28, 2014 by Kevin. A marine layer rolled in over downtown towards sunset. This is my attempt to paint those light effects from Grant Hill Park. 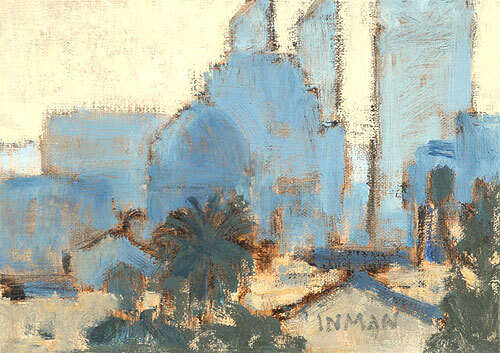 This entry was posted in Landscape Paintings, San Diego Paintings, Urban Landscapes and tagged 5 x 7 inches, california, downtown, grant hill, haze, light, marine layer, oil on linen on panel, san diego, sunset, yellow on January 25, 2014 by Kevin. Yellow leaves by the San Diego River. We have beautiful autumn weather in December, and I painted this on location last year, and found it in the cabinet a few days ago. I felt like it just needed a little more work and it would be ready to go. Here’s the final result. 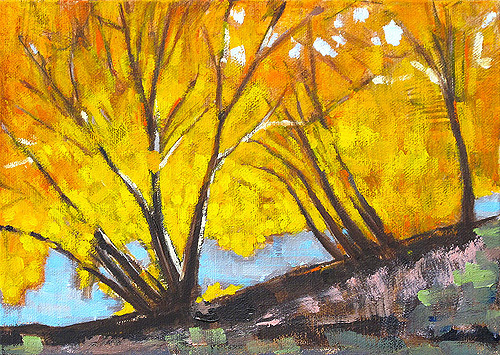 This entry was posted in Landscape Paintings, San Diego Paintings and tagged 5 x 7 inches, autumn, california, fall, landscape painting, leaves, oil on linen on panel, san diego, yellow on November 20, 2013 by Kevin. We took a trip through Temecula to get to Palm Desert recently and discovered the leaves were changing! 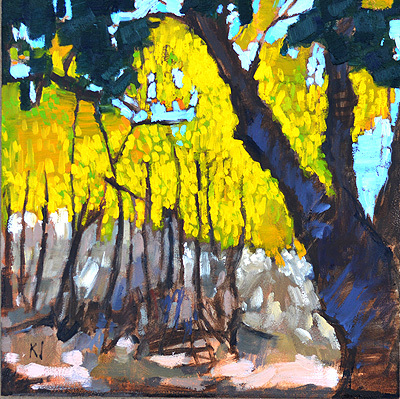 This entry was posted in Landscape Paintings, San Diego Paintings and tagged 6 x 6 inches, autumn, california, fall, forest, leaves, oil on panel, riverside, san diego, temecula, woods, yellow on November 15, 2013 by Kevin. 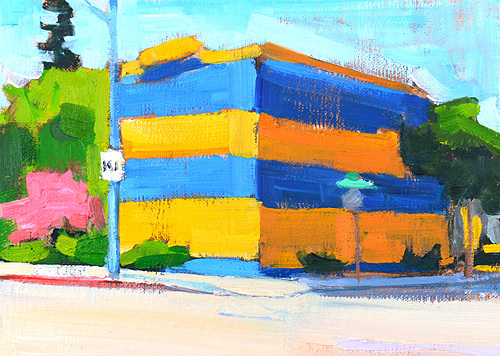 This entry was posted in Landscape Paintings, San Diego Paintings and tagged 5 x 7 inches, autumn, california, fall, leaves, oil on linen on panel, san diego, yellow on October 28, 2013 by Kevin.